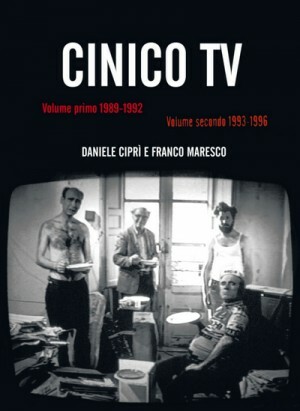 Cinico TV was a television show by Daniele Cipri and Franco Maresco, broadcasted on national Rai 3 television since 1992. The show comprised clips and interviews made by the two directors to the insane and dreary characters, with the desolate Sicily as background. Distinguishing mark was the particular black and white shooting. The characters were exclusively males: there's no space for womanhood in the bleakness and misery. Cipri and Maresco, working under the name of Cinico TV, have created a number of remarkable short video pieces, each embracing a distinct subproletarian Sicilian world, outcasts hidden behind Palermo's polished, conformist facade. Filled with "blasphemous, sexually aberrant images and a population of vile mobsters, hideous crones, and obese deviants," as one critic wrote, these short works prefigure and complement the duo's features (Toto Who Lived Twice shows May 5). Those seeing more than an intermittently comic freak show will be moved by the directors' embrace of their nonconformist heroes as their comrades, cocreators of strange, oddly beautiful yet bitterly satirical works distinctly separate from, and incompatible with, the aesthetic rules of the market and the mass media. The return of the most extreme, corrosive, gloomiest, defeatist, insulting, hilarious and entertaining series in the history of Italian television: the return of the unforgettable Cinico TV. Cineteca di Bologna publishing presents Daniele Cipri and Franco Maresco's complete cynical production in two volumes: the first DVD contains the films shot from 1989 to 1992; the second those shot from 1993 to 1996. The DVD presents a selection of the most memorable episodes, some of which were never broadcast. Furthermore, included in the extras are various statements from artists and men of culture for whom Cinico TV became must-view television.